The kitchen of the house was adjacent to the main living room, and to the hallway leading to all four bedrooms. 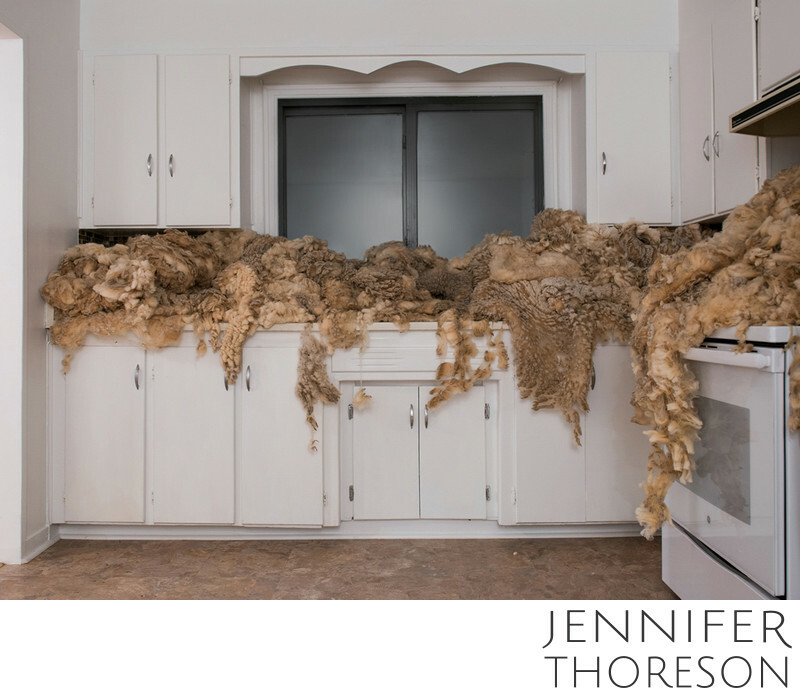 In this space, I covered the countertops, sink, and stove in freshly shorn white wool fleeces. The wool was heavy with lanolin, and fully soiled with dirt, feces, and detritus. The gold and brown hues of the wool exhibit its filthiness; once cleaned, the wool is creamy white in color. The room was extremely fragrant with the scent of animals, reminiscent of a stable. The dirty wool contrasts the bright white of the freshly painted cabinetry, and is an interesting pairing in a space such as a kitchen. It occupies surfaces where food is conventionally cleaned and prepared, in a part of a home that is generally kept most clean and sanitary. Throughout Testament, sheep’s wool is used as a symbol of the relationship between God and human kind, our limited earthly experience, and our vulnerability. This installation illustrates human failure, and the contrast between sinfulness and purity.